Regional governments in South Korea’s Chungcheong Province on the country’s western edge have teamed up to jointly bid for the 2030 Asian Games in hope that the international sports competition would foster the regional economic growth. Daejeon Metropolitan City, Sejong Special Self-governing City, North Chungcheong Province, and South Chungcheong Province on Thursday joined hands to host the 2030 Asian Games. 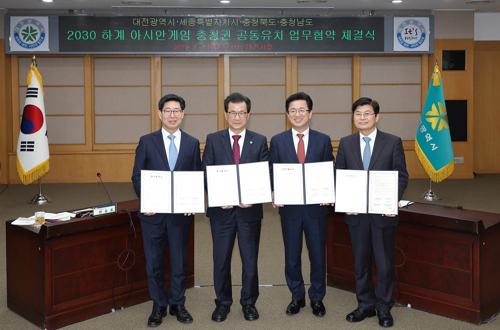 Mayors and governors of each municipal council attended a partnership agreement ceremony at Daejeon Metropolitan City Hall and agreed to promote joint efforts to host the international sports event. The four cities and provinces said they will put out efforts to boost sports exchange between South Korea and North Korea by having a unified team to make a joint entrance to the Asian Games. They expect the region’s host of the Asian Games would increase chances of co-hosting of the 2032 Summer Olympics by Seoul and Pyongyang that the South Korean government has been seeking for. It is also expected to further promote peace in the Korean peninsula through sports diplomacy that has already been gathered through the 2018 PyeongChang Winter Olympics and 2018 Jakarta and Palembang Asian Games, they insisted. The four cities and provinces also said they would be able to host the 2030 Asian Games with much less budget compared to the previous Asian Games held in other Korean cities because they already have a number of sports venues that meet international standards. They would need new facilities only for 17 sports out of 36 sports to be competed in the Asian Games and expect to spend a total 1.25 trillion won together. It cost 3.24 trillion won to host the 2002 Busan Asian Games and 2.05 trillion won to host the 2014 Incheon Asian Games in the country. The regional governments will inform the plan to the Ministry of Culture, Sports, and Tourism. The host city for the 2030 Asian Games will be announced in the first half of 2022.